There are two types of people in the world: people who can’t sleep on planes and those who can. I like to think that I’m living proof that you can move from the former category to the latter. I made the transition in two stages. First: I made the conscious decision—at the ripe old age of 39 mind you—to stop thinking of myself as a person who couldn’t fall asleep on planes. Once I eschewed that self-fulfilling prophecy, I started taking note of the kinds of things successful plane sleepers did and began integrating them into the way I prepared for and comported myself on long flights. Here are ten of the most prescient things I learned along the way. According to research, your chances of getting some decent sleep on a flight skyrocket if you’re in a seat that reclines more than 40 degrees. Here’s the rub: Your chances of finding a seat that reclines that much in coach or premium economy are, to put it mildly, slim. If you’re not ready to pay what an upgrade, your best bet is to do whatever it takes to get a window seat. Snagging a window means that your rest won’t be interrupted by a thimble-bladdered row-mate, you’ll be the decider of how how much sleep-disrupting light comes flooding into your row, and you’ll have a greater range of body positioning options, which we’ll get to a little later. 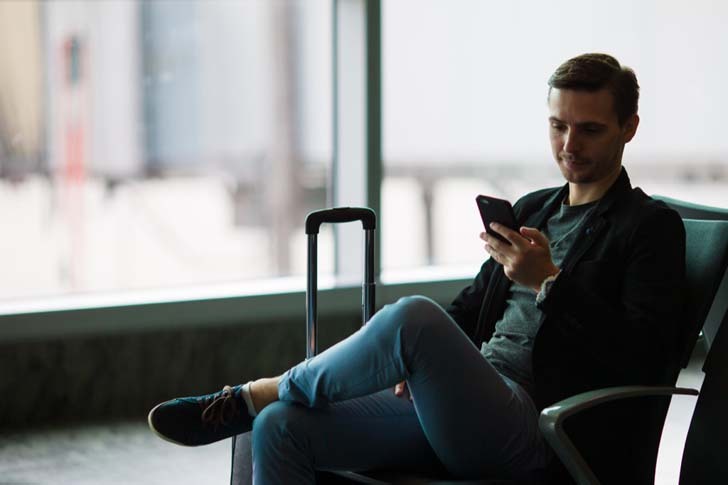 Now, you could leave it to chance and ask for a window seat when you arrive at the airport, but selecting a seat when checking in online becomes available is much smarter move. Some airlines charge a fee for selecting a specific coach seat and, should you decide to cough up some hard earned dough in the name of getting some better rest, opt for a seat as close to the nose of the aircraft as possible. 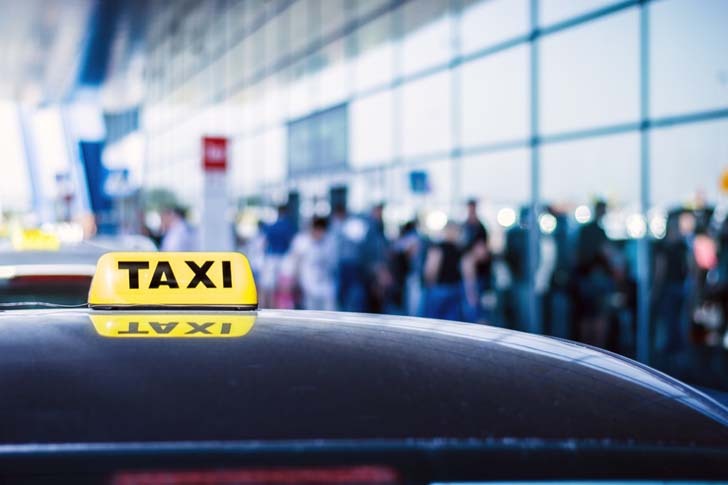 Your ride will be smoother and—because of the extra distance you’ll be putting between you and the engines—it will be quieter, too. (That’s why cabins get cheaper towards the back of the plane.) Note that not all rows have reclining seats. As we drift off to sleep, our muscles become more and more relaxed. But it’s relaxing neck muscles that can make good sleep near impossible because, when we’re sitting upright, our neck muscles have to keep working. Simply put, you’re going to better off with some neck support. The U-shaped pillow is the most ubiquitous travel pillow, though some doctors advise that turning it around so that the opening is at the back of your neck will offer more support. 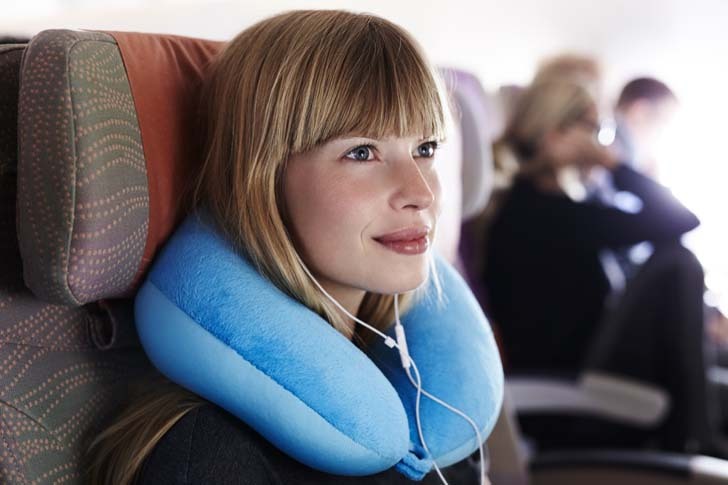 Recent innovation in the neck support field has resulted in the Trtl pillow. Half the size of a traditional neck pillow, the trtl (pronounced “turtle”) wraps around your neck like a scarf. Concealed within it is a strengthened inner rib that contours to any neck, jaw, or shoulder shape. If you’re without your pillow, take advantage of the adjustable headrest by pulling the wings forward. So much is happening around you on planes: The sensations, sights, sounds, and, yes, the smells. 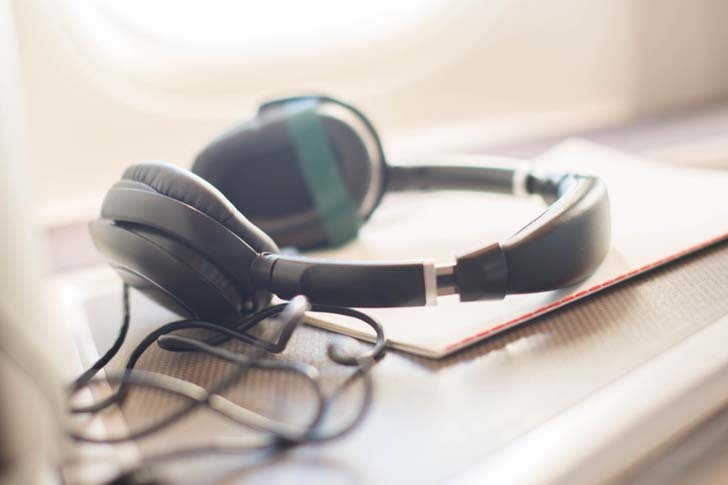 Never underestimate the power of noise-cancelling headphones and a comfortable sleep mask. Don’t forget to pack yours—and plan on escaping into your cone of silence and darkness at the earliest opportunity. There’s nothing you can do about the cramped quarters of a coach seat or the flight etiquette of your immediate neighbors. Concentrate instead on what you can do to make yourself more comfortable—starting with your outfit. We’re not saying you should fly in pajamas, necessarily, but you’ll probably be best served by looser-fitting clothes made of natural fibers if you want to nod off above the clouds. Also know that temperatures on aircraft can vary. That means that layering is your friend as are pair of comfy warm socks. Some airlines offer less-than-ideal polyester blankets on longer flights; others offer nothing at all. Bring your own travel blanket—or repurpose a wool scarf or pashmina—and take responsibility for reaching a comfortable snoozing altitude. 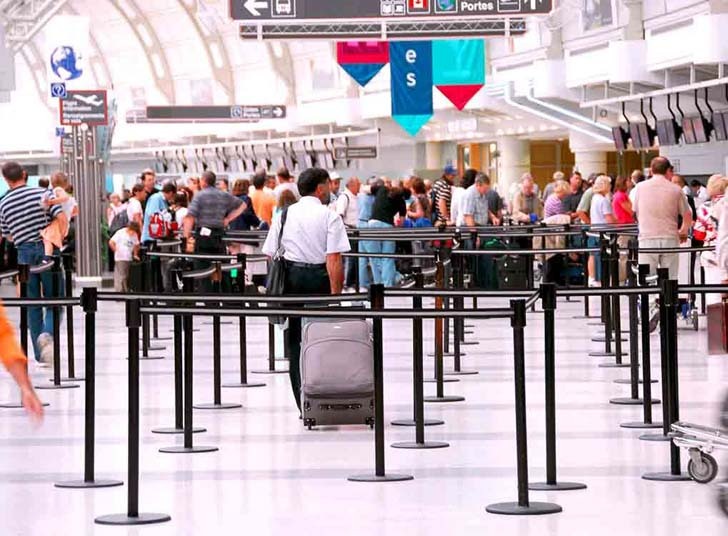 Rushing to get your flight is stressful and likely won’t have dissipated by the time you get to your seat, making it especially difficult to drift off. Use that extra time at the gate to perform as many elements of your regular getting-ready-for-bed ritual as you can. Head to the bathroom to brush your teeth, wash your face, or read some of the book that sits on your nightstand. These actions will tell your body that its time to sleep. Rarely in your life will you be advised to drink less water, but you’ll be super annoyed if your hard-won snooze is interrupted by an urgent need to use the bathroom somewhere over the Rockies. 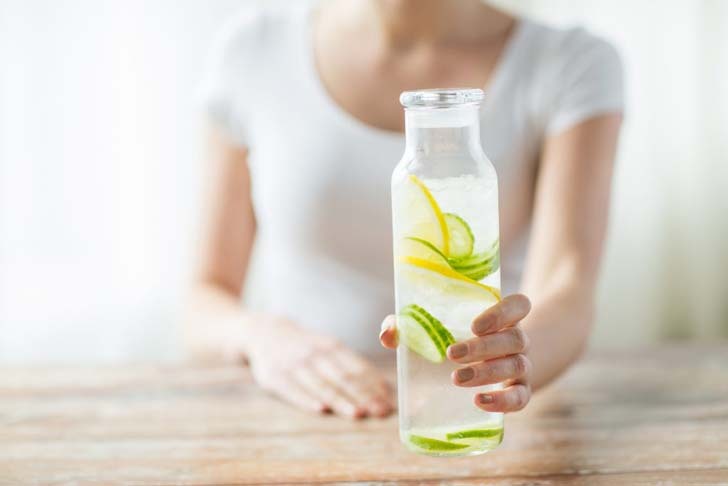 By all means, have a bottle of water with you, but ration it as best you can. Be smart about taking a sleep aid. How long is your flight? 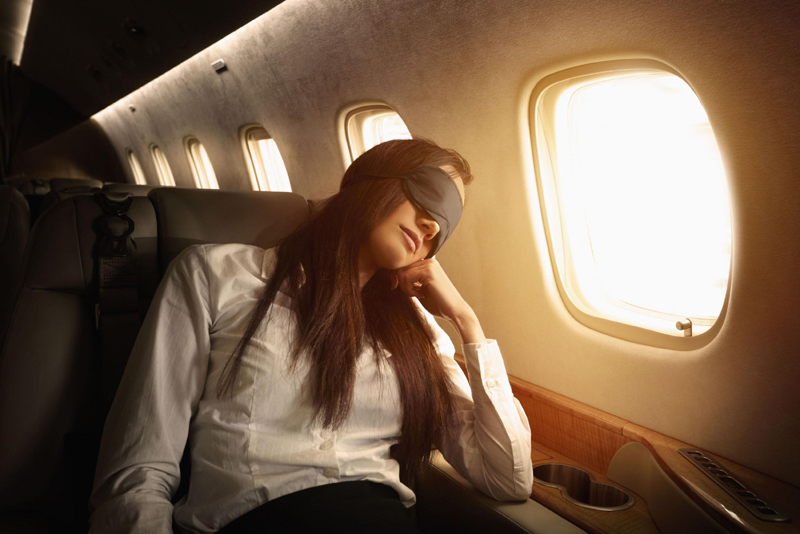 It’s important to know, because most over-the-counter or prescription sleep aids are likely to still be going on after even the longest-possible flight within the continental U.S. has ended. The sedative effects of Ambien, for example, will still be lingering eight hours after you popped your pill. Unless you’re taking a flight that’s at least eight hours long, it’s a better idea to take some melatonin just before you board. A hormone that’s made by the pineal gland in the brain, melatonin helps control your daily sleep-wake cycles. 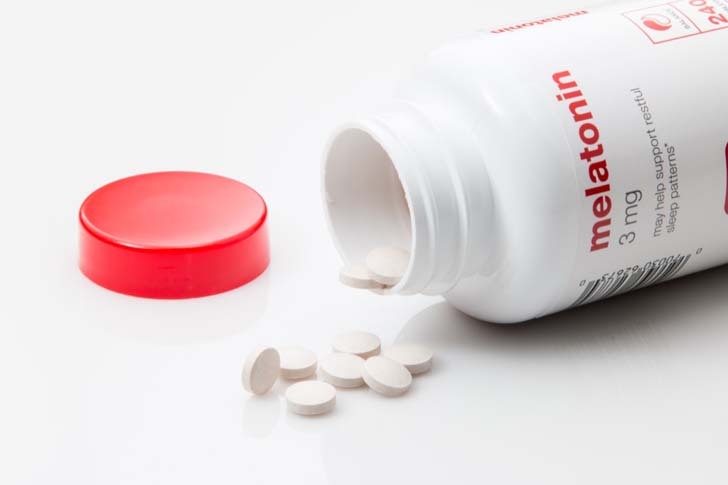 While the FDA hasn’t approved supplementary melatonin, several studies have shown it can be useful in shifting your circadian rhythm. Beyond airplane food’s dubious quality, the “chicken” or “fish” or “pasta” will arrive at your seat until an hour—sometimes two—after you did. If you’re flying from say, San Francisco to New York, more than a third of the flight time will have elapsed by the the flight attendant clears your tray table. That’s time you could have been sleeping. Eat a small, healthy meal before you board or—at the very least—pack a protein bar to eat before wheels up and immediately settle in to maximize the amount of potential in-flight R&R available to you. While a glass of red wine or two may help you doze off at altitude more quickly, you’ll likely wake up an hour or two later with cotton mouth, a feeling of grogginess and unable to get back to sleep. 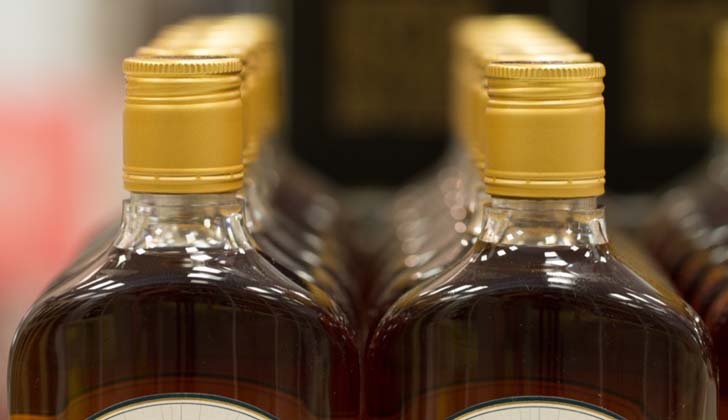 Alcohol reduces REM sleep, the phase of sleep that is thought to be most restorative. Whether you have a neck pillow or not, take advantage of your window seat and lean your head against the side of the cabin. Use a jacket or sweatshirt if you need more cushioning. Now, put the armrests down and use them. One study found that they helped alleviate back pressure. Rest your forearms on top to gently support your upper body and relieve your spine from working too hard. If you happen to be on the shorter side and are usually a front sleeper, you may have better luck placing a cushion or folded jacket on the tray table in front of you and resting your head on top of it. Oh, and if you happen to notice a row of three or more empty seats once you get airborne, don’t be shy about snagging them and having several more position options at your disposal. Now, pull down that sleep mask, concentrate on your breathing and drift off.